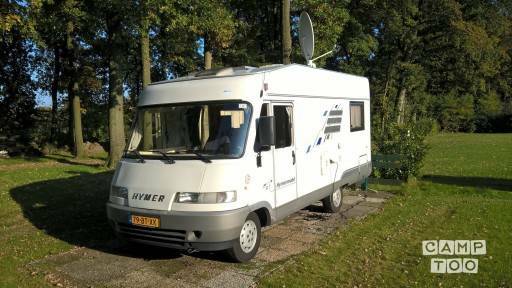 Our Hymer (Hymermobil) motorhome is a motorhome volintegraal B534 Fiat Ducato 2.5 TDI 85kW / 116PK. The camper has a 2-person folding bed and a cozy round seating. The round seat back can be converted into a spacious 2 bed. The pull-down bed has the advantage that it may be made up during driving. 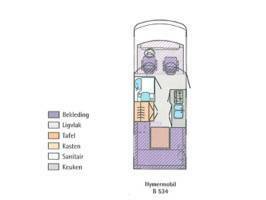 It is a great comfort and complete motorhome with a wide inventory. It also includes a side wall to which can be attached to the canopy. Ideal for wind and rain in the spring and autumn. The motor is always kept very well and is disabled and technically in excellent condition. With us is a dog permitted. Refer to 'Price' for rental rates. 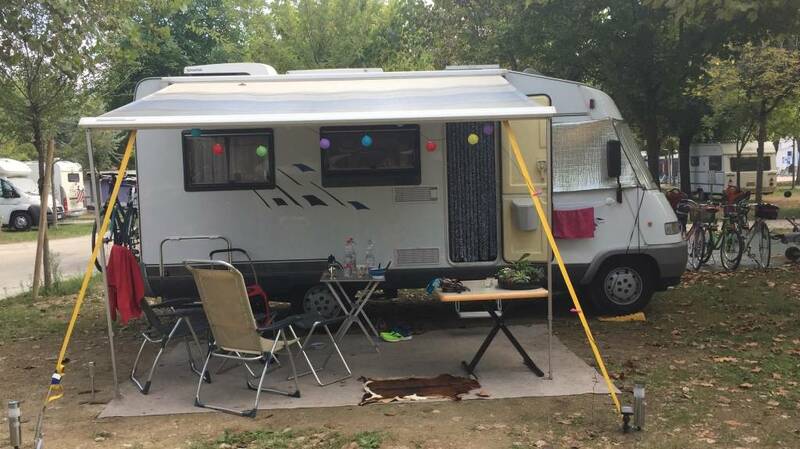 When the camper also includes a TV with fixed, self-seeking satellite dish ..
Pets (dogs) allowed: € 2.50 per day with a maximum of € 50, - per booking. The driver is three years in possession of a valid Dutch driving license for category B is 25 years or older. After checking every 1,000 kilometers or oil, other fluids and tire pressure at the correct level, and if necessary (to) bring. With each loss (W. O. loss, theft and seizure), as well as damage caused by the motorhome, the renter directly in consultation with the landlord, unless this is impossible due to circumstances. The tenant shall comply with the instructions of the landlord. If the camper within the rental period, the time of collection to the time of delivery, damage or a defect causing the motor short or long time is not useful, the tenant if it is guilty of the damage or defect, not entitled to refund of the rent for the period that the motor can not be used. The tenant has no right to a refund for the period in which he has a replacement motor. Any damage after returning from the tenant must be repaired by the landlord before one can leave any future tenant of the motorhome must notify the tenant in good time (ie before returning) to the landlord that the landlord is able to prepare and if necessary make arrangements for repair. At all times the renter must make contact with the landlord to resolve mechanical defects. On its own initiative repairs of defects does not automatically lead to compensation by the landlord of the costs incurred. The repair costs incurred after obtaining permission from the landlord will only be reimbursed by the landlord upon submission by the tenant of the original itemized bills, as well as presentation of the defective parts replaced. It may not produce the invoices and whether parts relieve the landlord of compensation. 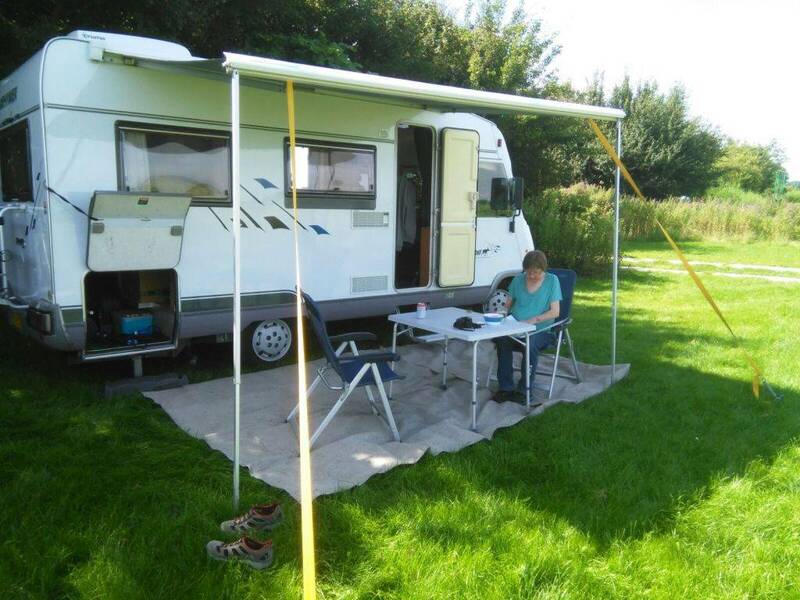 Een week deze Hymer gehuurd om te kijken of een campervakantie iets voor ons is. Het blijft een eenmalig iets voor ons, maar de camper op zich is ons prima bevallen. Zèèr compleet uitgerust, uitgebreide gebruiksaanwijzingen, alles werkte naar behoren, is goed met het overige verkeer mee te rijden, en de enthousiaste verhuurders kan je altijd bereiken met een vraag. The owner of this camper offers pick-up and drop-off services. The costs for this are 25 pence per kilometer.